On SmileyNetwork.com, you find a bank to free smileys and emoticons. Create your smiley with a program like Adobe Photoshop, Illustrator or Gimp. You can download the software for editing and image processing computer-aided Adobe Photoshop CS3 here. The creation software Adobe Illustrator vector graphics can be downloaded here. And the software Gimp is free and downloadable click here. 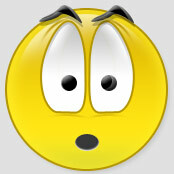 See how to create this cool emoticon with the tutorial. This smiley is a style Yahoo, illustrated explanations on this page. This smiley was created with the software Gimp, go to the tutorial.